White teas are made from the same plant, camellia sinensis, as black, green and oolong teas. White teas are special though, not only are they the least processed form of tea and so retain the highest concentration of antioxidant flavonoids, they come from the unopened buds and special leaves of the plant. White teas are a specialty of the Fujian province in China. They used to be a luxury served only to the Emperor of China. Today, fortunately, white teas are available to all, and since they taste delicious that's great! The best white tea is called Silver Needle tea because it is made from unopened buds which have silvery white hairs. White Peony is another kind of white tea, so named because of the mild aroma of peonies that emanates from the tea while it is being brewed. There are other white teas, such as Shou Mei also from China, made from the naturally withered upper leaf and tips and is darker in color almost like an oolong tea, as well as Darjeeling, Assam, Ceylon and African white teas. Silver Needle White Tea, or Bai Hao Yinzhen or simply Yinzhen tea is originally and primarily from the Fujian province of China. This white tea is the most expensive since it is made only from unopened top buds from the tea plant. It is also picked only in a short period in March-April, and when it is not raining. This makes it a rare tea, and rather expensive! This white tea, like all white teas, is made from the same plant, camellia sinensis, that is used for black, green and oolong teas. The name of this white tea comes from the silvery white "needles" or hairs on the buds. It is the inclusion of only unopened buds and different processing that makes it a white tea. Silver Needle white tea is very delicate, but if it is of good quality it can be steeped for a longer time without harm to the flavor. The flavor should be delicate and slightly sweet. For those who want to try the real thing, the best Silver Needle White tea, get it in loose leaf form. Of course, without the hassle of loose leaf tea you can still enjoy white teas. Buy some in tea bags! White Peony or Bai Mu Dan is another white tea from China. It has often been considered a lower grade of White Needle tea, but this is not correct. White Peony tea always includes new leaves as well as buds; the best quality White Peony being made with the proportion "two leaves and a bud." 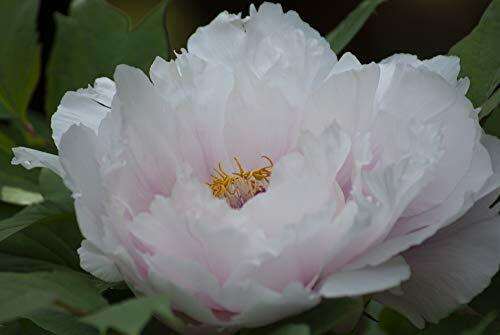 Like Silver Needle tea, White Peony tea is picked only on a few days in the year, when it is not raining. Again, it is a rare tea, and expensive! The name White Peony derives from the aroma of white peonies that becomes apparent when brewing this white tea. The resulting drink is usually pale green or golden, somewhat darker than Silver Needle. Can't you just smell these peonies, and imagine drinking the tea! You can buy delicious White Peony tea in loose leaf form. And there's also a selection of White Peony tea in tea bags, for convenience. There are many other white teas available in addition to the Silver Needle and White Peony varieties. Still from China, and mostly grown in the Fujian Province, comes the Shou Mei (Noble, Long Life Eyebrow) tea. This white tea is plucked later than the White Peony and as a result is somewhat darker in color. It is produced from tips and upper leaves that are naturally withered, giving this white tea a stronger flavor almost like oolong tea. Darjeeling White Tea comes from India. 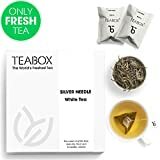 This white tea has fluffy light leaves and when brewed it has a delicate aroma and a pale golden color with a hint of sweetness in its taste.The tea is hand picked, hand rolled and then withered in the sun. Assam White Tea is produced in the Assam region of India. It is much lighter than Assam black teas, and produces a naturally sweet drink. Ceylon White tea has delicate notes of pine and honey appears as a golden coppery color. This white tea is grown in Sri Lanka, rolled by hand with the leaves dried and withered in the sun. From Kenya and Malawi in Africa come African Silver Needle Tea. This white tea is usually higher in caffeine and richer in flavor than Chinese white teas. This is one of my favorite holiday season teas. It's made by Harney & Sons so you know it's good quality! The tea is a mixture of white tea blended with almonds, vanilla and cardamom, accented by white chamomile flowers. It smells delightful and tastes amazing - warm and comforting with a hint of sweetness! If you buy this lovely tin you get 30 beautiful sachets of tea. Steep them for about 3 minutes - no longer or it gets bitter. The Chinese have used teas for medicinal purposes for centuries, and in recent years the West has become aware of this aspect of teas. White teas in particular are considered beneficial to one's health because they are made by a process that retains the greatest concentration of antioxidant flavonoids, catechins, which are organic compounds believed by many researchers to have beneficial effects. A wide variety of health problems, including cancer, stroke, heart failure, cancer, bone density, dental caries and even infections have all received reports of reduced prevalence among those drinking tea high in catechins. White tea - Article on New World Encyclopedia. White Tea Guide - A website dedicated to the wonder of white teas. Do you enjoy White Tea? 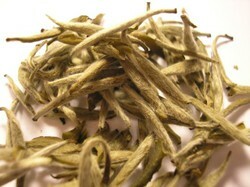 Assam White Tea Silver Needle is gaining real popularity due to its unique taste. It's actually quite delicious! 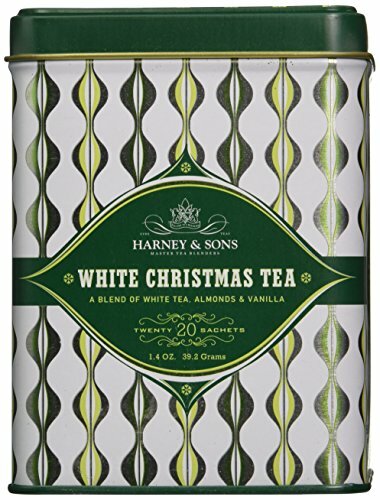 We had some "White Christmas Tea" this year, which was a blend of white tea with almonds and vanilla - very festive! I have never taken white tea, but you have explained it well.